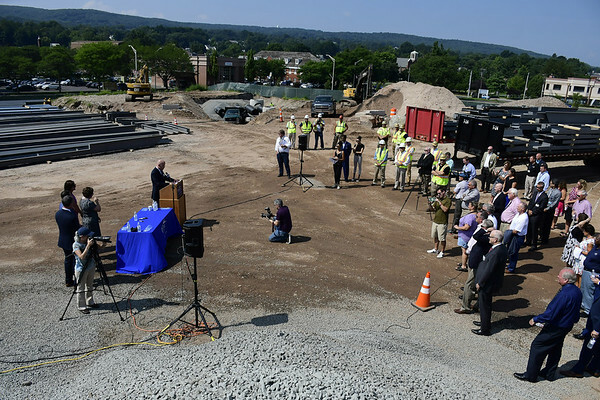 BRISTOL - Standing on a construction site filled with dirt and gravel, with the skeleton of a three-story building as a backdrop, Bristol Hospital President and CEO Kurt Barwis spoke Tuesday of his expectations for the hospital’s new Ambulatory Care Center. Barwis said he sees the building on the corner of Main Street and Riverside Avenue filled at this time next year with physicians, staff and patients - marking one of the first steps in the city’s planned downtown revitalization. 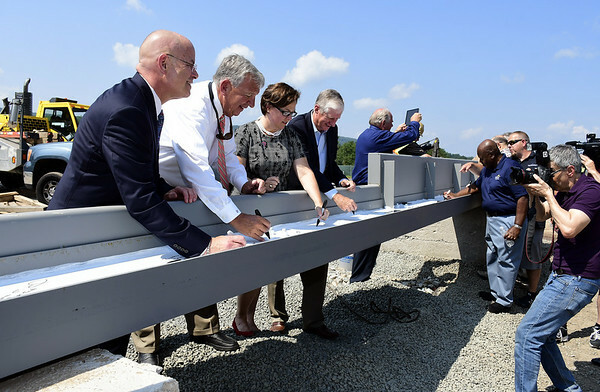 “All along we have said we see this building serving as a springboard for future development on the former downtown mall site,” Barwis said at Tuesday’s ceremonial event, during which hospital leaders, state and city officials, and community members signed one of the final beams for the second floor of the 60,000-square-foot Ambulatory Care Center. The Ambulatory Care Center, which is slated for completion next spring, will house a number of sub-specialties, including cardiology, neurology, orthopedics and rheumatology, as well as space for laboratory and physical and occupational therapy services. 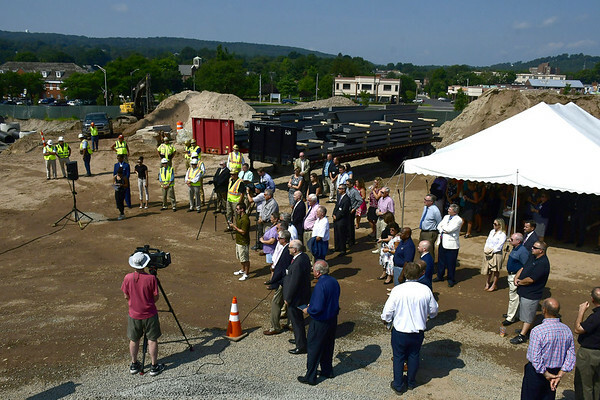 Barwis hinted that the Ambulatory Care Center, construction of which began in the spring, may not be the only building hospital officials erect on the site that sat vacant for years. 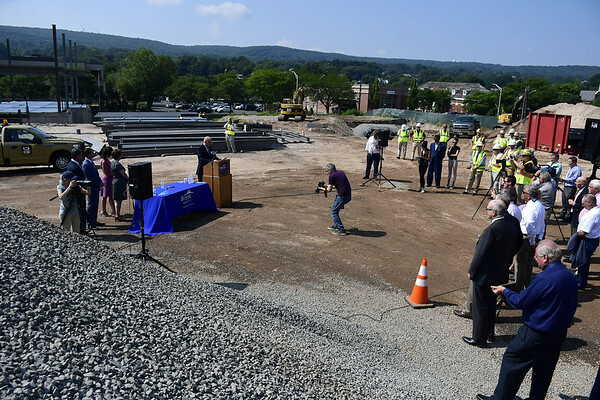 Mayor Ellen Zoppo-Sassu said the completion of the construction will eventually lead to the filling of the other parcels at the corners of the old mall site. “We have some interest, and we also have some flutterings in some of these other vacant retail spaces that have been sitting here for far too long,” Zoppo-Sassu said. Although the project, announced in 2015, has had its setbacks, officials representing the hospital and the developer acknowledged that all parties involved, including city leaders, worked very hard to get a deal done that would benefit everyone involved. Richard Rendina, chairman and CEO of the project’s developer, Florida-based Rendina Healthcare Real Estate, compared the process to a puzzle. It took “a lot of hard work and dedication” to get this done, Rendina continued. 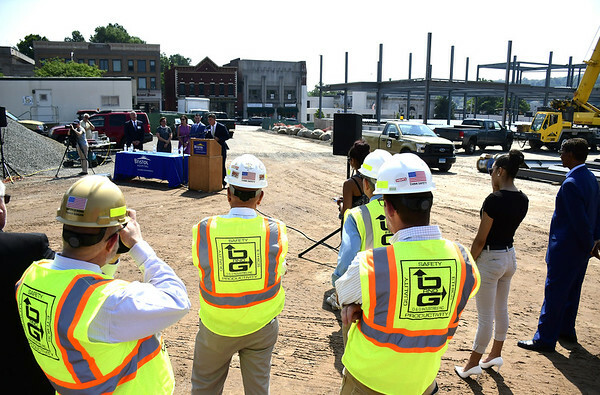 In addition to having benefits for the city’s downtown, Barwis said the new building has helped the hospital in physician recruitment, which he callled very competitive in Connecticut. 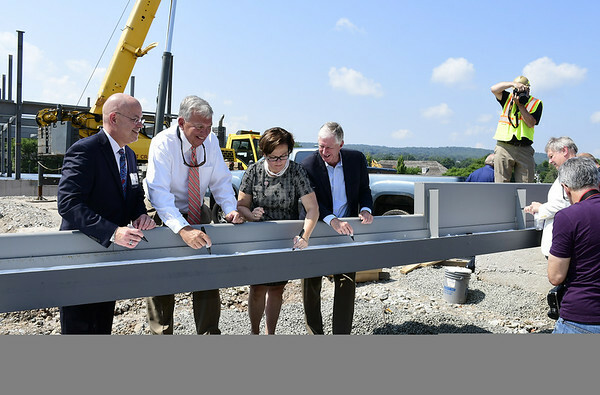 “In terms of recruitment, we’ve actually had quite a few physicians in this last recruitment cycle that kind of focused on the fact that we were going to have this exciting new facility to work in, and I think it’s helped us significantly,” Barwis said. According to representatives from Rendina, the steel structure should be done by the end of August. The next step will be decking and slabs for the first and second floors. Posted in The Bristol Press, Bristol, General News on Tuesday, 7 August 2018 20:36. Updated: Tuesday, 7 August 2018 20:39.